Genetic counseling is an exciting profession that combines advanced education in human, molecular, and medical genetics with skills and experience in counseling. Genetic counselors are health professionals with specialized graduate degrees and experience in the areas of medical genetics and counseling. Most enter the field from a variety of disciplines, including biology, genetics, nursing, psychology, public health, and social work. 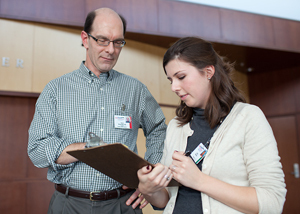 Please follow the link to find out more about the UW-Madison Genetic Counseling Program.